Please enter each passenger's name and date of birth (DOB) as it appears on official identification documents. Required for tours that include flights. 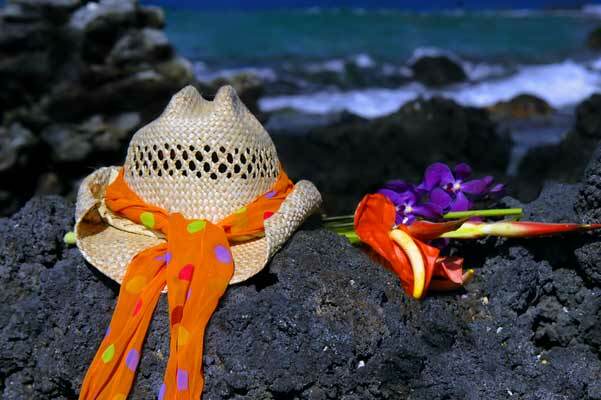 Heat Up Your Big Island Vacation! This is Big Island adventure! Stand at the edge of the world as you glare into a glowing crater. 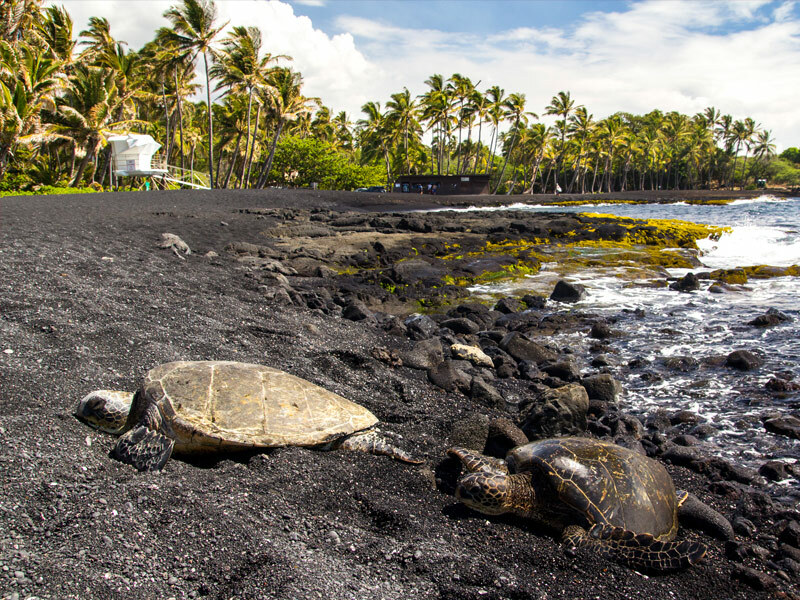 Explore active volcanoes, see how these violent eruptions created the world renowned Hawaiian islands, and cool off with green sea turtles on a black sand beach. You may not want to leave after the mist of the famous Rainbow Falls hits your face. 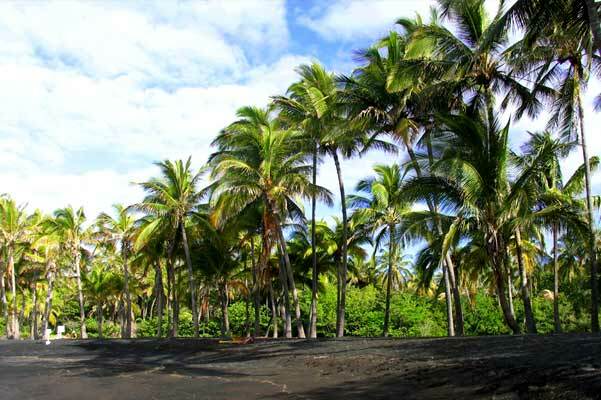 All this and more is waiting for you on the Big Island and its amazing! Your exciting day begins when you are picked up in Waikiki for a transfer to the airport. Then board a 45-minute flight to Hilo on the Big Island. 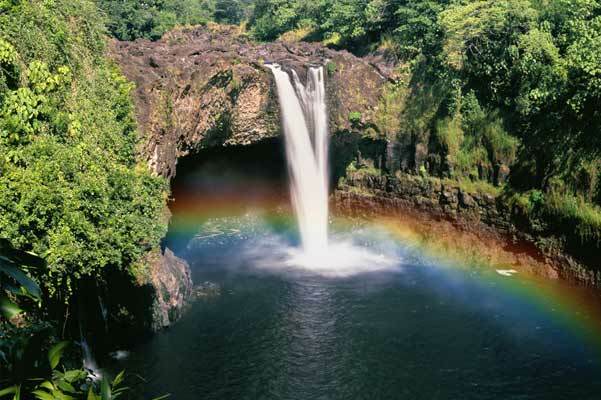 Next stop is Hawaii’s most famous waterfall, Rainbow Falls. This is a great photo opportunity; when the sun hits the spray from these powerful falls a beautiful rainbow is created. Next you’ll head to Hawaii Volcanoes National Park, but we will make a snack stop at the Mauna Loa Macadamia Nut Factory on the way. You can see how macadamia nuts are grown and processed. Try the fresh macadamia nuts and pick up a gift while you’re there. Then the volcano adventure begins. 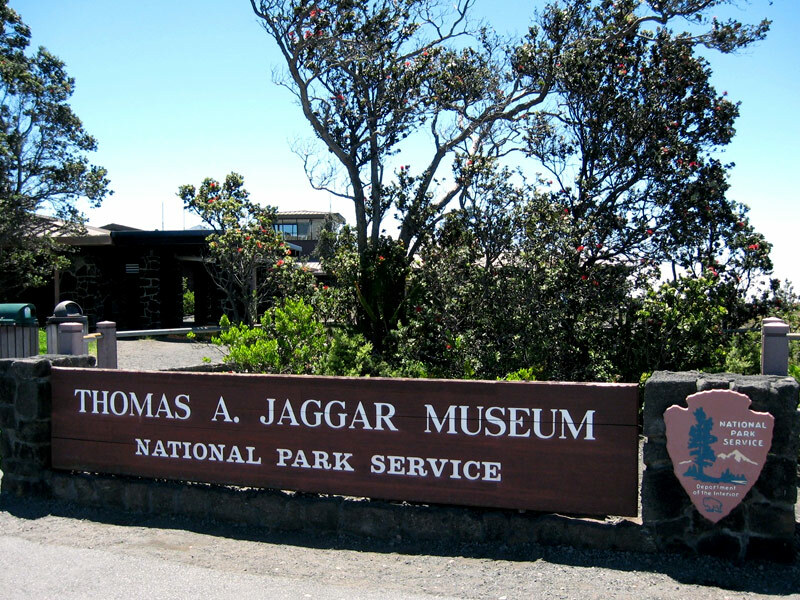 In the Jaggar Museum you can see fascinating exhibits about the volcano and how important it is to Hawaiian culture. The scientific exhibits of the museum will also give you a good understanding of the volcano. Stand at the edge of the Volcano House to view the Halema’uma’u crater. 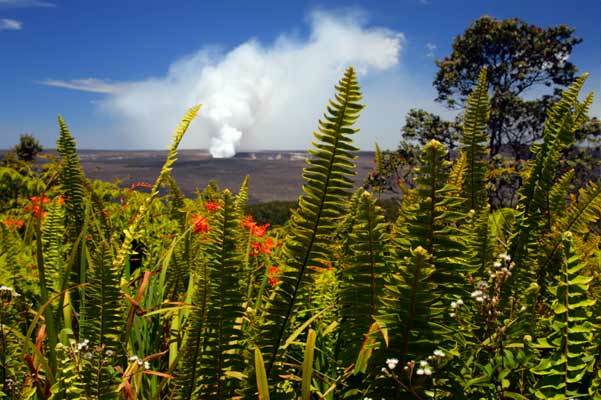 Part of Hawaii Volcanoes National Park is desert and part is tropical rain forest. 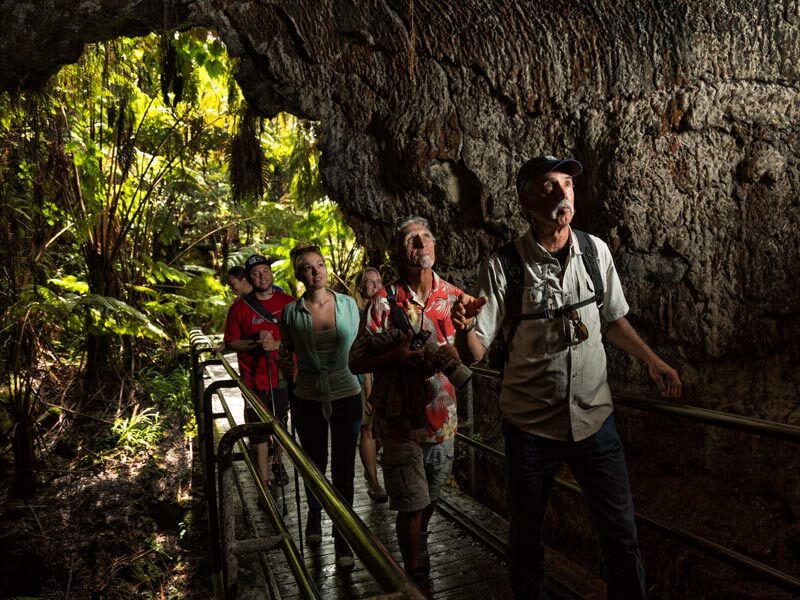 As you enter the tropical rain forest, you’ll see massive tree ferns and native birds. 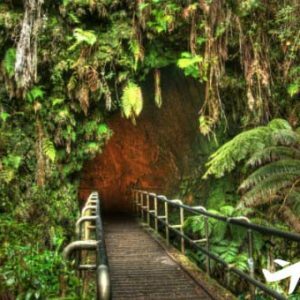 We stop at the Thurston Lava Tube, where you can walk in a cave that was formed when molten lava was flowing through it. As you return to Hilo, we’ll stop for a no-host dinner before you fly back to Oahu. 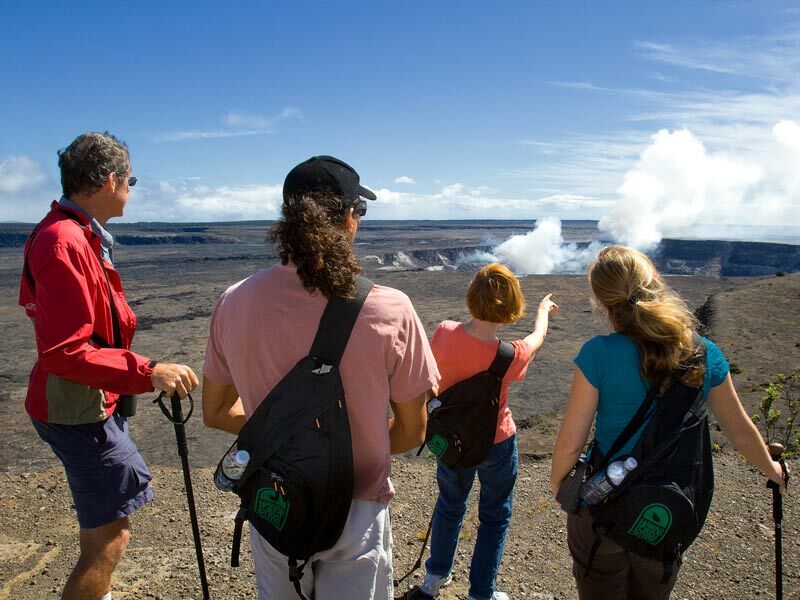 This inter-island tour is an excellent way to see as much as you can of Hilo and the Volcano in a single day. 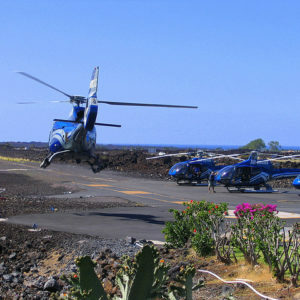 With transportation, flights, admissions, and narration included, we take the worry out of your volcano tour from Oahu. This is a great place to visit while you are on the Big Island. 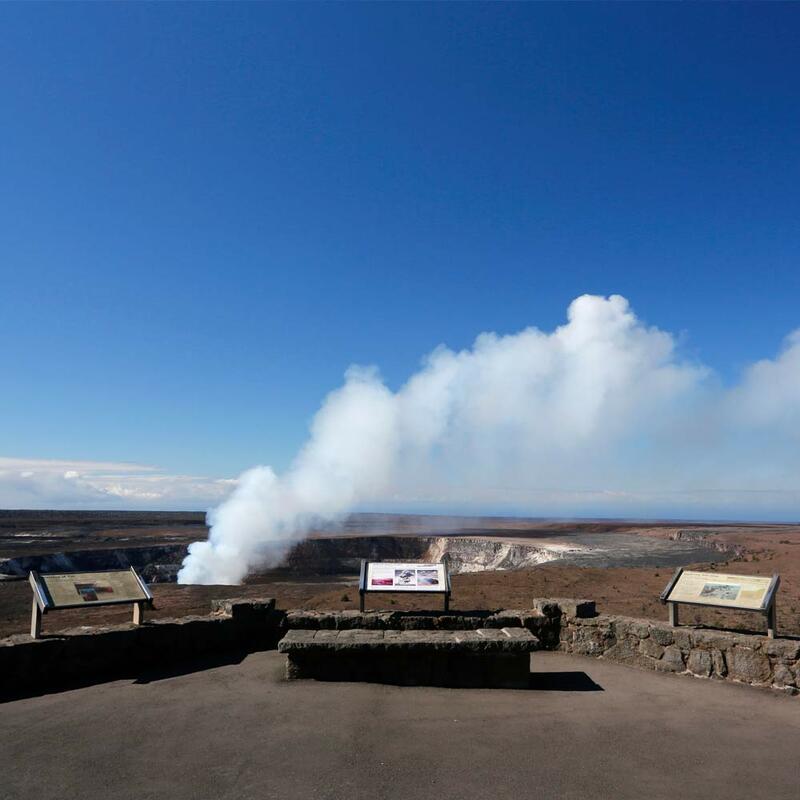 Driving the Chain of Craters Road, walking through lava tubes, and a stop at the Jagger observatory where you can see lava fountaining into the lava lake were a few of the stops recommended for our four hour visit. Excellent viewing of lava action. Couldn’t be better. I am glad we went. Must see while on the Big Island. Awesome sights and the lava crater was amazing. A must see at sunset. Also, take the time to see the lava arch as well We visited the interior of the park to go through the Thurston Lava Tube, steam vents and the caldera viewing area. Great adventure for the whole family. Be sure to bring a jacket as the temperature drops in the higher elevations. There is no where quite like this place on earth. Jagger Museum –from the terrace of this museum you have a great view of active volcano and lava flows. 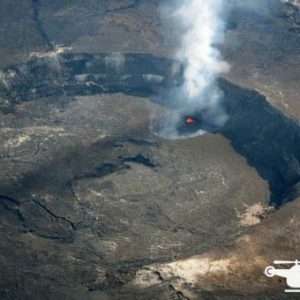 You will be looking at the center of the Kilauea Crater. Then take a few minutes to visit the Volcano House. It is an old hotel which was frequented by Hollywood stars at some point. I was amazed seeing the lava flows across years and getting to know the evolution of islands is phenomenal. I have seen yellow stone park as well and I strongly recommend both (there are some similarities). Where else can you be so close to an active volcano as at the Jaeger Visitor Center. You will never experience anything like it on this earth. It was kind of a rainy day. We had brought binoculars with us, so we could see the lava flowing quite well. 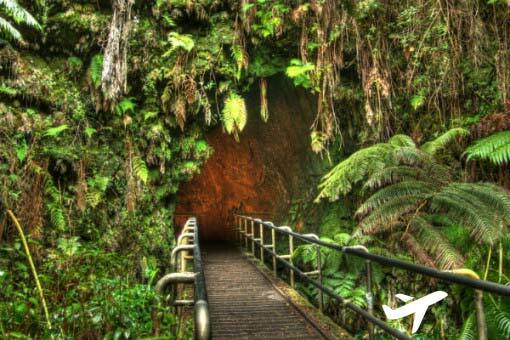 We walked thru the Thurston lava tube, that was really cool. The crater is filled with lava and you can now see lava spewing out from the one side. Need a camera that is good for distance, as it’s a ways away. Along the road you see steam vents. There is so much to see in this park and it’s all fascinating. Toured both Crater Rim Road and Chain of Craters Road to see the sights. 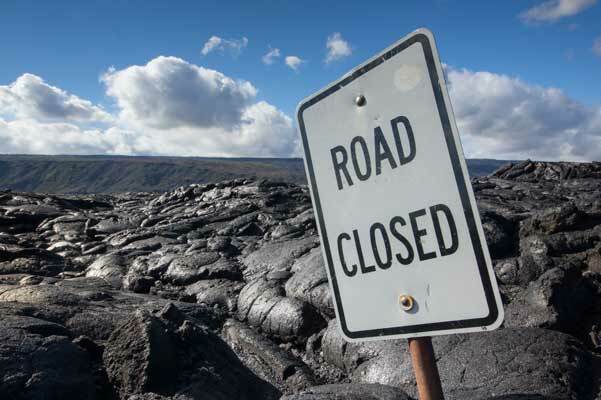 A must see is the bottom of the latter where lava meets sea. A one of a kind National Park unlike most. 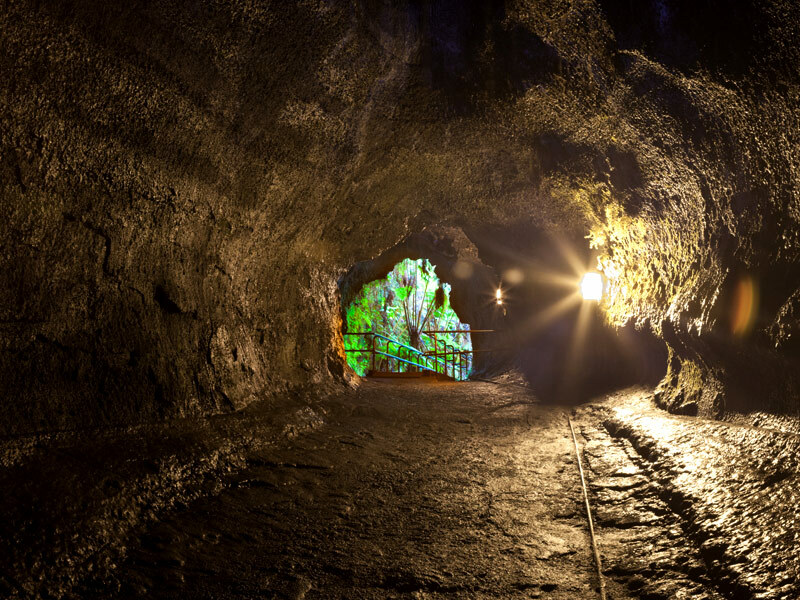 As you explore the exhibits in Volcano House and see the caldera, it’s awe inspiring. All you have to do is read the description of this tour. So many cool things we were able to see! Was super happy with this tour, most likely because our flights and tour guide were all on time. I definitely loved Hawaii Volcanoes National Park! This National Park needs to be on your bucket list. 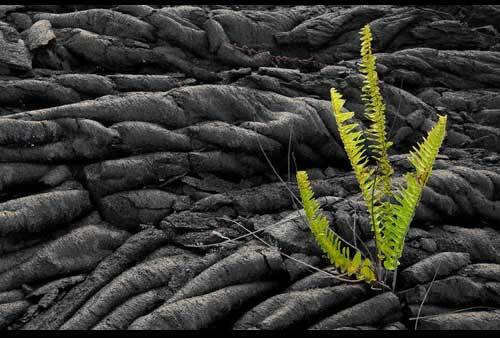 It’s amazing to see what lava has done to the land. As of today, the lava is actively flowing. Absolutely a trip of a lifetime. So many fantastic hikes, flora and an active volcano. We flew into Hilo, had breakfast in town, then Mark picked us up and took us around the island. We saw the lava fields, lava tubes, black sand beaches, went swimming in the hot springs, and ate like locals. Hawai’i Volcanoes National Park was AMAZING! We took the tour with Jon. (a teacher) This guy was a plethora of knowledge. I was worried I’d be bored. But the day flew by. He talked about the history of the islands. 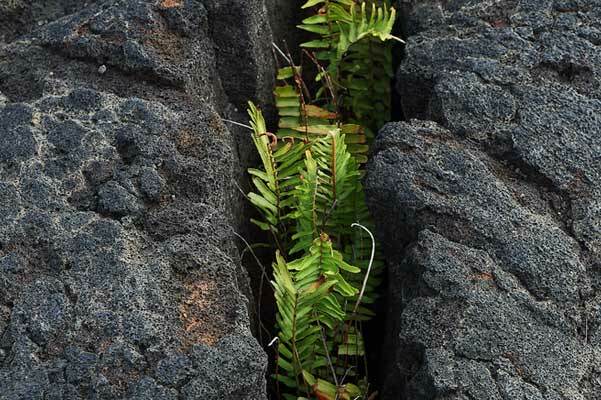 The Hawaiian gods,different types of lava, island micro climates. We did go back the next night on our own to see the glow of the lava. 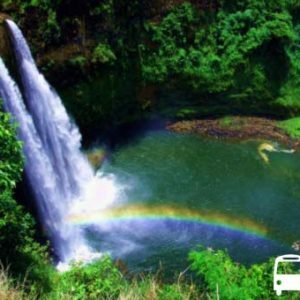 If you are on the Big Island I recommned this tour! 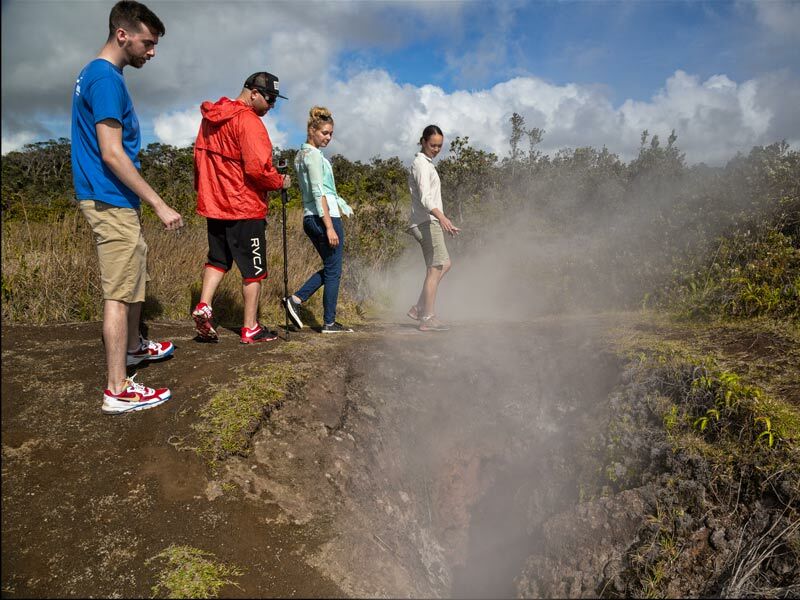 A fantastic tour of the volcano national park. Black sand beach, steam vents and volcano museum. Seeing the glow from the volcano crater after dark was really fantastic. All in all, I cannot say enough about the quality of the tour, and the knowledge of our guide. Once purchased, this tour is NON-REFUNDABLE and the tour cannot be cancelled. We can try to change dates, but there is no guarantee of availability. 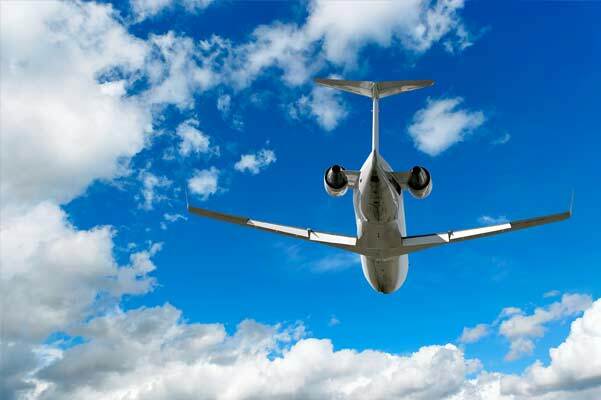 Airline change penalty fees may apply and vary by airline and fare type. Bring sunscreen. It can also be sunny. There is a dinner stop. Bring cash or credit card to purchase dinner. Standard TSA rules apply on the commercial flight included in this tour. That means that you must provide us with your name exactly as it appears on your valid, government-issued ID. You must have your ID for airport security check-in. International guests must bring a valid passport for airport security check-in. Tour highlights are subject to change without notice and may vary at tour driver discretion in order to take into account National Park Service advisories, weather advisories, traffic advisories, road closures and detours, and venue hours of operation.